"The best references of our company are satisfied Investors, who come back to us in case of their future investments"
We are a Dutch company with over thirteen years of experience in investing in the Polish market. We implement a lot of investments leading to the extension of our plant, located in Zalesie Małe, Poland. Mr. Mirosław Stachowski with his company ?Projektowe Usługi Budowlane? provides comprehensive services in the development of project documentation and obtaining all relevant permits for the construction of our first facility. The company always fulfils their contractual obligations in a professional and timely manner – regardless of whether it is a design of conversion or reconstruction of existing facilities, or the design of a production hall with an area of approximately 5 000 m2. The designers are always conscientiously involved in all stages of the implemented investment. The abovementioned company is highly recommendable. During our cooperation we have constructed several facilities with a total building area of approximately 16 000 m2. We are a Dutch company with more than twenty years of experience in the Polish market. We implement a lot of investments leading to the extension of our plant, located in Zalesie Małe, Poland. Mr. Mirosław Stachowski with his company ?Projektowe Usługi Budowlane? provides comprehensive services in the development of project documentation and obtaining all required approvals, conditions and permissions from the construction of our first facility to this day. The company always fulfils their contractual obligations in a professional and timely manner. 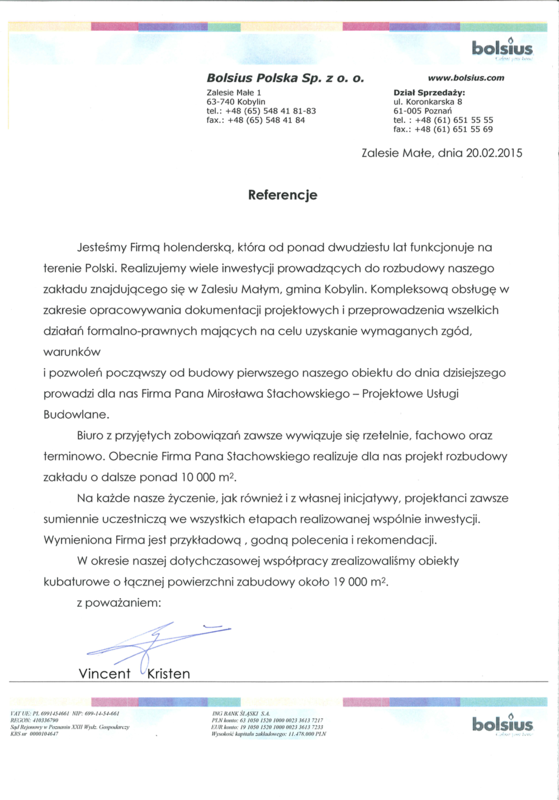 Currently, Mr. Stachowski’s Company implements our project of plant extension by more than 10 000 m2 . The designers are always conscientiously involved in all stages of the implemented investment. The abovementioned company is highly recommendable. During our cooperation we have constructed several facilities with a total building area of approximately 19 000 m2 . The company ?Projektowe Usługi Budowlane? developed construction documentation for our company’s newly built factories of vibro-pressed concrete elements in Gajków and Zielona Góra. 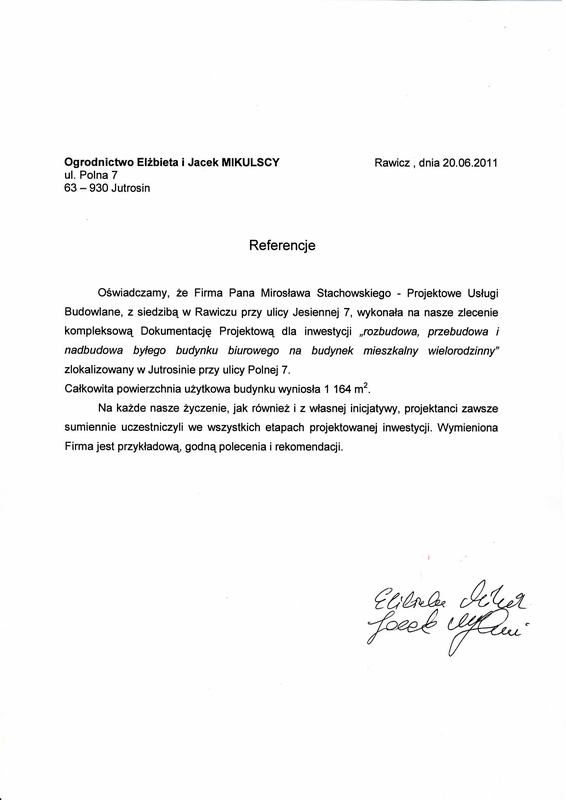 It also developed documentation of the reconstruction and comprehensive modernization of a similar factory in Rawicz. In 2006, the company developed a full-discipline civil engineering design of the modern production facility of pipes and concrete rings in Wszemirów. These orders were always performed on fixed dates, in a reliable and professional manner. Our cooperation continues to this day and we do not see it changing. Mr. Stachowski’s company is currently developing designs for further investments of my company. Polski Koncern Mięsny DUDA S.A. certifies that the company ?Projektowe Usługi Budowlane? is involved in the activities of our company from the beginning of its operation, in subsequent investment plans implemented on the premises of the factory in Grąbków, as well as in activities of several other companies of the capital group. The commissioned design works are always implemented in a comprehensive and timely manner, in accordance with general building regulations. Individual designers support subsequent stages of different investments conducted by our company. Facilities constructed according to the designs developed by Mr. Stachowski’s company were always seamlessly put into service at the stage of obtaining relevant permits. The company ?Projektowe Usługi Budowlane Mirosław Stachowski? based in Rawicz developed comprehensive project documentation of the construction of a production facility of rapeseed oil methyl esters located on our company’s site in Góra, Wincentego Witosa 7 street. The constructed facility has a total building area of about 8 000m2. The company obtained all the necessary and required arrangements, technical and other conditions, including the building permit on behalf of our company. Design works were performed in accordance with the requirements of our company and the requirements of modern production technology of esters. 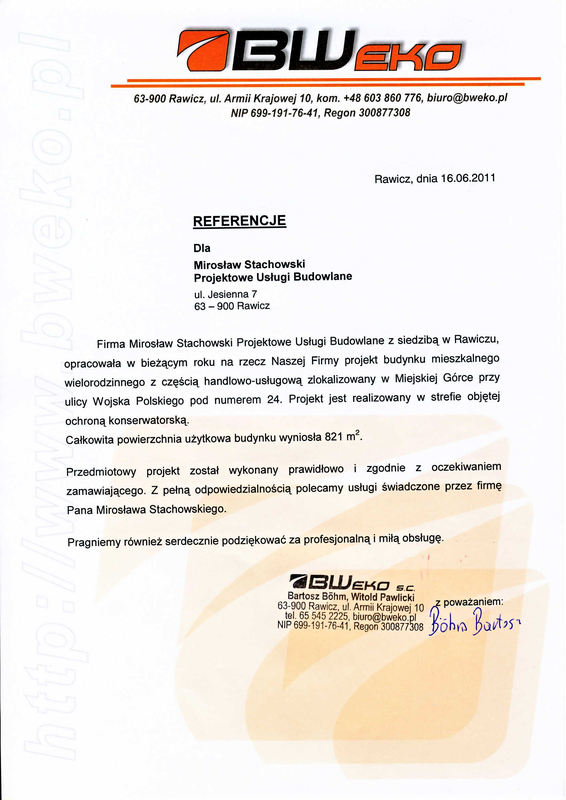 It is hereby certified that the company ?Projektowe Usługi Budowlane? developed the design of production building with a paintshop, design for the conversion of the hall into a paintshop with a warehouse and social-office building and construction design of an assembling hall of sound-deadening cabins for our company over the period 1998-1999. These designs were implemented professionally and on time. In addition, the company actively participated in the implementation of already constructed facilities. Mr. Mirosław Stachowski began working with a group of companies PK ?PIEPRZYK? in 1993 as an individual, and continues the cooperation under his company ?Projektowe Usługi Budowlane Mirosław Stachowski?. This long-term cooperation resulted in the development of project documentation for all major construction projects implemented by our company. These were full-discipline civil engineering designs of petrol stations, car washes, hotels, restaurants, administrative buildings, buildings and facilities related to agricultural production and many others. Individual investments were implemented in a comprehensive, timely and professional manner. 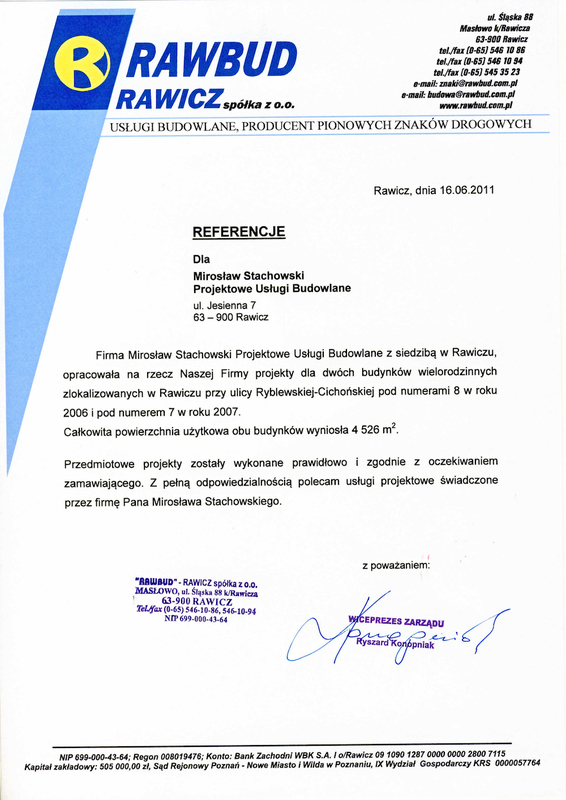 In case of further investment plans we declare a desire to cooperate with Mr. Stachowski’s company. The company ?Mirosław Stachowski Projektowe Usługi Budowlane? based in Rawicz developed designs for two multi-family buildings located in Rawicz on Ryblewska-Cichońska 8 street in 2006 and on Ryblewska-Cichońska 7 street in 2007. The total usable area of both buildings was 4 526 m2. These designs were implemented correctly and in accordance with expectations of the customer. I recommend the design services provided by Mr. Mirosław Stachowski’s company. The company ?Mirosław Stachowski Projektowe Usługi Budowlane? based in Rawicz developed, for and on behalf of our company, the design of a multifamily residential building with a shopping area located in Miejska Górka on Wojska Polskiego 24 street. The design was implemented in the area covered by the legal conservation protection. The total usable area of the building was 821 m2. The design in question was executed properly and in accordance with expectations of the customer. I recommend the design services provided by Mr. Mirosław Stachowski’s company. We would also like to sincerely thank for the professional and friendly service. We declare that Mirosław Stachowski’s company ?Projektowe Usługi Budowlane?, based in Rawicz Jesienna 7 street, developed comprehensive documentation for the investment ?reconstruction and conversion of an office building into a multi-family residential building?, located in Jutrosin on Polna 7 street. The designers are always conscientiously involved in all stages of the implemented investment. The abovementioned company is highly recommended.